Set of six Arts & Crafts Glasgow school oak dining chair comprising of two carvers and four singles. Most probably by Wylie & Lochhead. Offered in a good and firm condition but with some wear to brown leather seats on the underside.The 2 armchairs are 107cms in height 60cms wide at the front of the arms. Depth 56cms. Arm height 70cms. Seat height 46cms. The singles are 104cms high. 46cms wide, 44cms deep and have a seat height of 46cms. 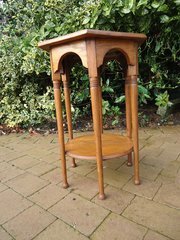 Arts & Crafts oak table in the Moorish style with a nicely arched apron and a hexagonal top very much in the style of William Birch with ring turnings. This has been stripped and re finished but we were unable to remove the deep oil stains. Apart from that the table is in good condition and if one were to use it to place a large item on the top, it would not be so obvious. This damage is reflected in the price as they usually sell for double. Height 74cms. The top measures 55cms x 49cms. Delightful small Arts & Crafts copper tray with a Ruskin cabochon to each end set in swirled handles. This measures 39cms in length and 18cms wide. Depth 1cm. Offered in good condition with no damage to cabochons. Minor over polishing to sunken base. Arts & Crafts copper tray in the style of Keswick with round piercings to raised edges and a lovely floral design. Unmarked and offered in good condition. Length 55cms. Width 23cms. Depth 2cms. 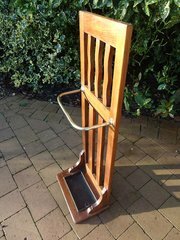 Arts & Crafts magazine rack with piercings to sides and made in quarter sawn oak showing its beautiful grain. It has a divided compartment to the base for magazines and a book trough suitable for books or CDs to the top. Height 76cms. Width 53cms. Depth 22cms. Offered in good original condition with a few very minor marks. 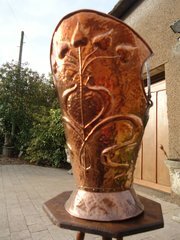 Arts & Crafts two handles copper vase attributed to John Williams of Fivemiletown. A delightful design of leaves shaped as hearts and stylised buds. Width at handles 22cms. Diameter 10cms. Height 22cms. Offered in good condition. 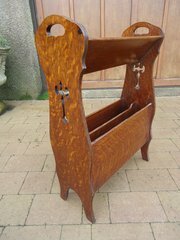 Arts & Crafts book trough made in quarter sawn oak and having elegant lines. Offered in good condition measuring 49cms in length. Height 10cms. Depth 15cms. 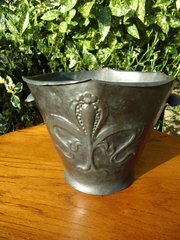 Arts & Crafts pewter jardiniere made by William Soutter and Sons of Birmingham and stamped to base. It has a styiised seed head design to the front and a good studded join to back with curled rim. Offered in used original condition showing some signs of wear but is watertight although slightly misshapen. Height 19cms. Width at handles 28cms. Diameter at base 21cms. Lovely Arts & Crafts Newlyn school copper coal box attributed to Charles Eustace of Hayle (1876-1957). 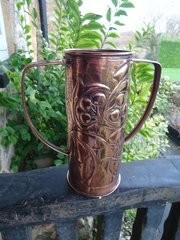 A similar one is illustrated in Colin Pill's book on Cornish Metalware. There is a galleon or luger to the front and one each side set against the setting sun. Lovely detail to handle. 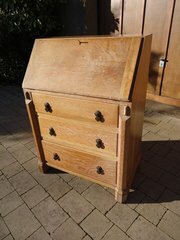 Offered in good condition and has a heavy liner which makes the lid sit a little proud. Height 36cms, Width 38cms. Depth 35cms. lid sit slightly proud.